Pam has been doing book binding and book repair since 1990. 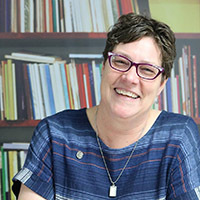 She worked in the preservation lab at UW Madison while getting her Masters in library science. She took a semester-long class learning bookbinding and box making and also took papermaking and Artists Books classes. Pam has been teaching book related classes for 25 years, including several years teaching classes offered at Rochester public library. If you love books, you may be interested to learn how to create your own. 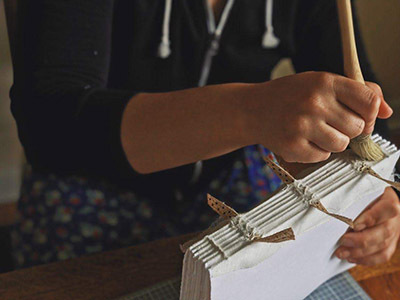 Hand-crafted books can become sketchbooks, journals, or lovely gifts. Bookbinder Pam O’Hara will get you started on Sun., September 16, 11am - 3pm. You will build basic bookbinding skills with a focus on sewing multiple signatures. You will take home a finished hard cover 3/4 binding, including book cloth and handmade paper, with marbled endsheets. You will learn about bookbinding terms and tools, and where to find them. Learn a new craft while coming to appreciate the treasured books in your own library. Price is $50 plus $18 supplies.